Friends, this post is all about useful cooking tips for Indian working women, beginners in cooking, bachelors, stay at home moms with babies in hand and for house wives who wish to finish the morning chores quickly and easily without any tension .These pre-preparation ideas would help you feel relaxed and manage to do quick and easy cooking during the busy, hectic weekdays. Recent days I have been getting mails to share some simple lunch menu ideas for busy weekdays by spending less time in kitchen. Very soon I will start a lunch menu series suggesting some easy and healthy Indian lunch recipes for daily cooking. Before that, I wanted to make a post about useful cooking tips & pre preparations to make the job easier. As I have worked for an year after marriage, I have seen & heard from my colleagues about the difficulties in managing home and career.Time management plays a major role here. For me, there was no problem at all as I was in a joint family. My in-laws did all the household chores and supported us very well.In this present day nuclear family setup, many people does not get the luxury of moral & physical support of elders to share cooking and other household responsibilities. So it would be really tiresome and stressful if we don’t plan things ahead. I hope these simple, handy tips and tricks would be helpful to make the kitchen chores easier and stress free. Don’t worry, these pre-preparations won’t eat your weekend’s relaxing hours. You may need to spend just 2-3 hours to finish all these works or you can get the help of your servant maid to finish this job quickly. This will save lot of time during busy weekdays. Before going to this post, I must thank my friend Shalini for helping me to frame these points as she is regularly following these things.Love you lots dear . She also shared some pictures from her kitchen. I have made them as a collage and given below. Friends, I hope this post would be useful to plan & manage things easier. Working women and bachelors, please share your valuable tips you follow in your daily cooking in the comments section. It would be of great help for the people who read this post. Thanks in advance. Ok, now lets see some smart cooking tips and secrets to be a super wife and mom.This post is with more & more of stories and essays. Please bear with me. DISCLAIMER : All the points I have shared below is based on the ideas I got from my working friends. I have also gone through some websites and magazines for more tips. Please modify or skip the suggestions as per your wish & need. You need to have a refrigerator, pressure cooker and some good air tight containers to make & store the dishes. According to me a 2 burner gas stove, 3 small pressure cookers, few ladles, mixing bowl and a mixer grinder is enough to cook even for 10 people. Pressure cooker is my biggest strength. It helps to cook any food quickly and easily. 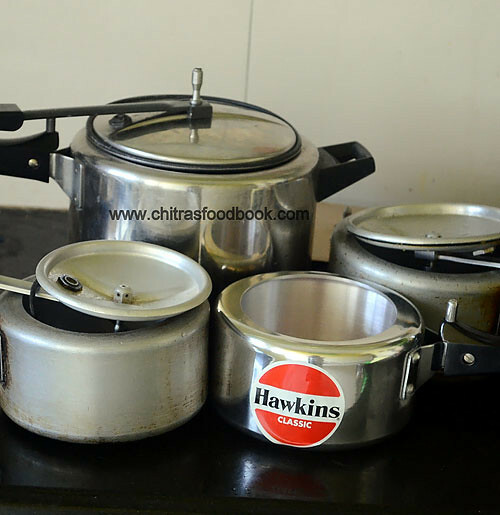 I have shared the pictures of my cookers above for your reference.I use 3 Hawkins small sized pressure cookers ( 1.5 liters and 2 liters) and one 5 liter cooker. I use 2 of them for lunch preparation and 1 for cooking breakfast. I use the big sized cooker only for my guest. I will share how I use these cookers for quick cooking in my upcoming lunch menu series. Make a weekly timetable for the menu according to your family's preferences. Keep a list of all the dishes you want to cook in the following week and write down all the required ingredients so that you can purchase all the groceries and vegetables as per the list.If you don’t like to spend time in grocery shopping, go for a monthly purchase. Refer my “Monthly Grocery list” post for the idea. You can buy vegetables once in 10 days and store them in refrigerator. I follow this every month to save my time spent in shopping. This point is especially for people who rely on Idli dosa recipes. Grind Idli dosa batter, Appam batter, Adai batter during weekend and store it for a week. 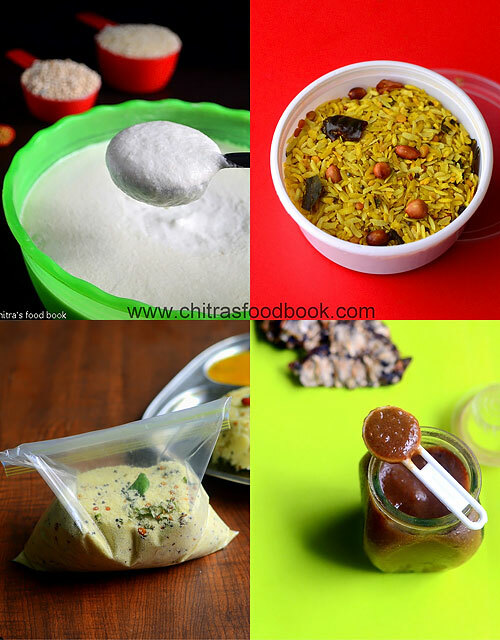 You can even make millet idli, dosa batter and store it for one day. Idli, dosa batter is a real savior in Indian cooking. You can make idli, dosa, uthappam, Paniyaram for breakfast and dinner as well. Similarly you can also grind and keep batter for dosa varieties like Set dosa, sponge dosa, poha dosa etc. It will help you for sure. My friend Shalini's maid helps her to grind varieties of idli and dosa batters during every Sunday for the whole week's use. Even though I am a house wife, I too grind all the batters during weekends and use it mainly for the week's breakfast because I don't want to hit my head thinking about breakfast recipes during busy morning hours. Generally I make Instant dosa varieties, Instant idli varieties like oats idli, rava idli, upma recipes like wheat rava upma, vegetable rava kichdi, millet recipes, Ragi roti, Phulka or stuffed paratha varieties for my dinner. I try to avoid consuming rice at night. Check out my Idli varieties post for varieties of idli,dosa batter. Check out my easy dosa batter recipe too ! For other options, you can make instant dosa varieties, upma varieties for breakfast or dinner. Make roti dough well in advance and refrigerate it. The kneaded dough will remain fresh for at least 2-3 days. You can make use of this dough for making roti , poori and stuffed paratha. Remember to store in an air tight box. Take only the required quantity of dough from the box and immediately refrigerate the leftover dough. But try to use it within 3 days. When we have idli, dosa batter in our hand, we start to hit our head for making side dishes. That’s quite natural. So prepare some side dishes like tomato thokku without onion, tomato thokku with onion, onion tomato chutney, garlic chutney, Raw onion chutney, Idli Podi/Gun powder, green chutney without coconut based on your preference and store in an air tight box. It will stay good for a week. 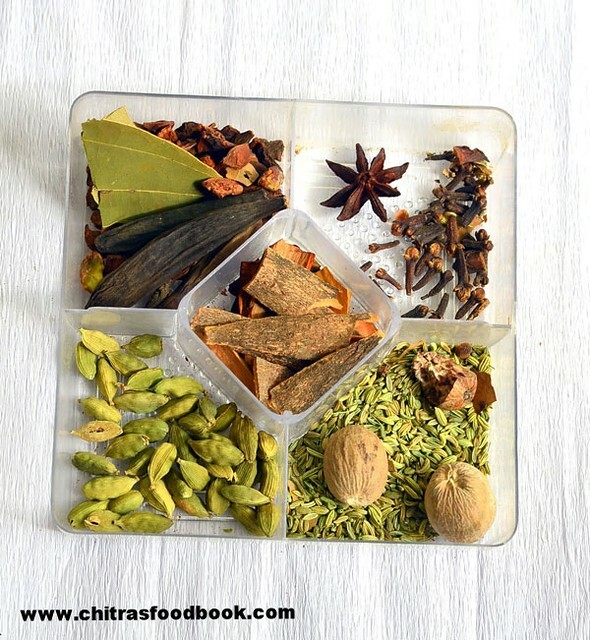 You can use these chutneys as side dish for idli, dosa, appam and roti or use it as sandwich spread too. I usually make onion tomato chutney and stock it for my daughter’s breakfast and lunch box. For roti, you can prepare side dishes like capsicum-tomato curry, tomato thokku, pickles and even jam for your kids. You can even cook Dal for making dal tadka or dal curry and refrigerate for 3 days. If you love to have pasta, you can make white sauce & pasta sauce ahead and store them. Check out my 50 chutney recipes for more ideas. 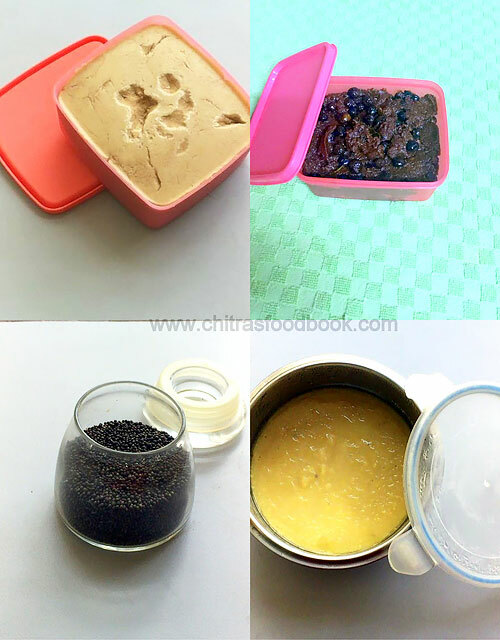 For quick lunch, you can prepare and store Pulikachal paste/Puliyogare paste, Lemon rice paste, coriander thokku, thogayal varieties, Vathakuzhambu paste and podi/powder varieties like Dal powder/Paruppu podi, Dhania/coriander seeds powder, Angaya podi, Sundakkai podi, Poondu podi/Garlic powder, coconut podi etc. Kuzhambu varieties like vatha kuzhambu, poondu kuzhambu, milagu kuzhambu, kara kuzhambu, tomato gravy, brinjal gravy stays good for even 2 -3 days with or without refrigeration. So you can make them once or twice in a week apart from sambar and rasam. Check out my 30+ kuzhambu varieties post to get the links for the above recipes. Roast rava and keep in bulk. It will help you to make upma quickly. You can also make Rava/sooji upma mix, Poha mix, pongal mix, rice upma mix in advance and store in the freezer. It helps you to make your breakfast or dinner quickly and easily. Always keep a packet of bread in stock for making quick sandwich or toast. Vegetables like carrot, beans, peas, cauliflower, sweet corn, cluster beans, spinach, broad beans can be diced or chopped & frozen for a week.If you want to use the vegetable for the next day morning, you can simply refrigerate the chopped veggies. Do not freeze them. Usually I keep frozen peas and frozen corn always in stock. Grate 2 coconuts and store 3/4th of the quantity in a zip lock cover.Deep freeze it. Store the remaining coconut in refrigerator. Just thaw it for few minutes before use or use warm water to grind the coconut. Take the required quantity of coconut, refrigerate it and keep the remaining in freezer immediately. De-stem coriander, curry leaves and mint leaves and store in an air tight box. Mostly I use palak leaves during weekdays as it is easy for cleaning, chopping and cooking. During weekends, I buy other greens/Keerai varieties, clean them and store in a ziplock cover.Do not chop onions and store. It attracts more bacteria when its cut. Apart from chopping veggies, you can make some lemon juice and store in a glass bottle, peel garlic cloves, Peel &finely chop ginger, peel small onions and keep them ready for usage. But remember to store the chopped vegetables in a clean zip lock cover and refrigerate. Cook toor dal or moong dal in large quantity, refrigerate/freeze and store in a box for 2-3 days use. Take the required amount and make sambar instantly. Soak beans like rajma, dried peas and chana for 8 hours and refrigerate them for later use. You can easily cook a quick meal like pulao, biryani or gravies & even make a healthy salad with it. Sprout green gram and other legumes based on your liking and keep them in the freezer. So whenever you want to have some salad, you can semi cook and have them ready. Grind and keep tomato puree, homemade tamarind paste, ginger-garlic paste, onion paste, sauce varieties ready in hand. You can also keep some readymade seasoning, green chilli paste.Some people keep some sauteed, browned onions too. I have seen some of my friends making onion-tomato puree adding masala powders and keep the base ready for making North Indian gravies. If you have enough time in hand, you can even make two to three varieties of curries and refrigerate them. Vegetables like potato, cauliflower, sweet corn and peas can be boiled in advance and refrigerated for later use. You can even cook pasta and store them in the fridge. Keep curd, buttermilk, paneer, cheese and other essential milk products ready in hand so that you can use it for raita, buttermilk/ Chaas, lassi, gravies and sandwich. I have summarized the above points and shared a TO-DO list for weekend. Do this according to your preference and time in hand. Grind idli, dosa batter and other batters if grinding. Soak pulses & lentils like rajma, chana/ kabuli, peas. Chop all the required vegetables. Make frozen peas and sweet corn. De stem green leaves/Spinach, coriander leaves, mint leaves and curry leaves. Cook toor dal and moong dal in large quantity for making sambar & dal for roti. Make white sauce and pasta sauce for cooking pasta recipes. Prepare rava/sooji upma mix, poha mix, dosa mix, pongal mix. Make onion tomato base for North Indian gravies. Purchase week’s grocery and vegetables. Friends,I hope this post will be helpful to you. Thanks for visiting this page !! 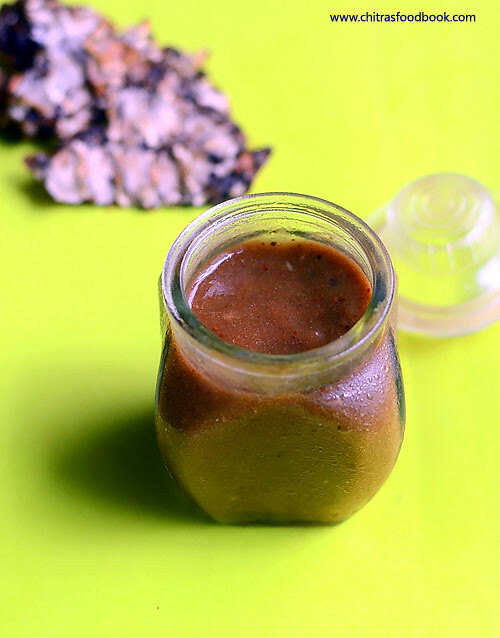 Tamarind paste/Tamarind pulp ( Puli Paste) is one of the most important ingredients for making sambar, rasam, vathakuzhambu in South Indian cooking. I have seen my friends buying tamarind paste from stores every month in their grocery purchase. But I don’t have the habit of using store bought tamarind paste as I am concerned about the use of preservatives. So I soak tamarind everyday before I start cooking and take tamarind pulp freshly. But most of the time I forget to soak and do it in last minute by heating the tamarind in water for quick soaking . 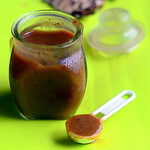 Recently when I was talking with my friend Shalini, she told about her homemade tamarind paste. She said its handy for quick cooking and the wastage of tamarind would be very much reduced. She told me to try it once to believe .Last week I made tamarind paste just for 1 week usage and stored in refrigerator.As she told, its really useful and I am impressed with this. It saves more time especially while cooking during busy morning hours. I am sure it would be a big help for working women. You can make it in bulk quantity and preserve for months by keeping in refrigerator. It would be much better than store bought tamarind pulp. Lets see how to make tamarind paste at home and store it. Soak tamarind in 1 cup of hot water for 30 minutes to 1 hour. Tamarind will become soft and well soaked.Squeeze the tamarind and remove seeds, grits if any. ( If you feel, there are more hard shells/ grits, add 1/2 cup more water while soaking so that all the grits will settle down, remove the thick tamarind OR squeeze the tamarind hard so that the grits will settle in your hand) Grind the soaked tamarind adding little water. Grind to a thick paste. Mix with the soaked water and transfer the paste through a colander and squeeze the paste well. Discard the waste if any. Add the required salt and store in an air tight glass bottle ( preferably) and refrigerate it. You can follow this method if using the paste for one week to 10 days. If you want to preserve the paste for more than a week, proceed to the next step. In a wide bowl, take the tamarind pulp and boil for 5 minutes in medium flame. It may splash everywhere. So keep it closed and stir it once or twice in the middle carefully. Switch off the flame. Mix well and let the paste cool completely. Tamarind paste resemble like a cream. After the paste is cooled down completely, store in an air tight glass jar and preserve it for months. You can also keep it in a porcelain jar( Peengaan jaadi). 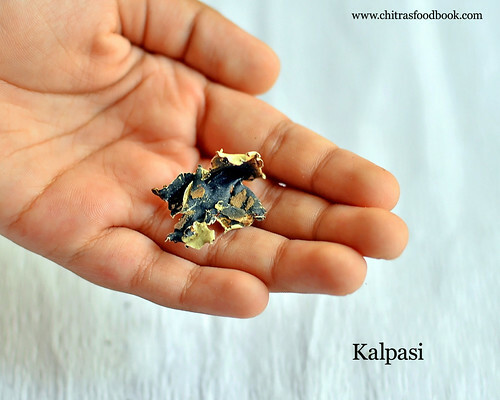 Add 1.5 tbsp of this paste for sambar, 2-3 tbsp for vathakuzhambu and 1 tbsp for rasam based on the number of serving. 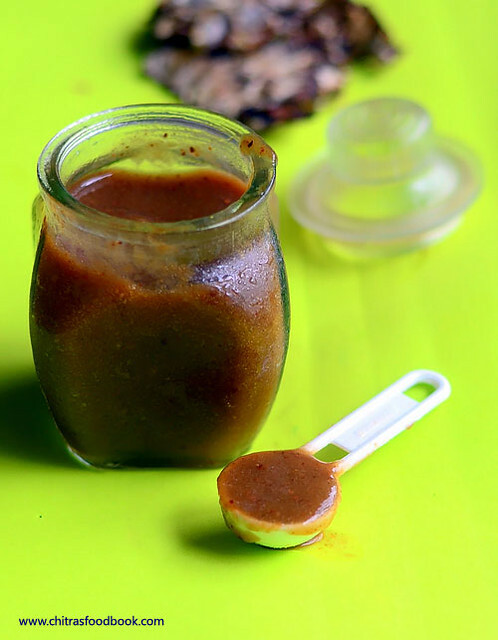 You can preserve this tamarind paste for months only if its cooked. If the pulp is raw, you can store it only for a week or max 10 days. You can add 1 tbsp of cooking oil to the paste while it boils which acts as a preservative. But I used only salt. 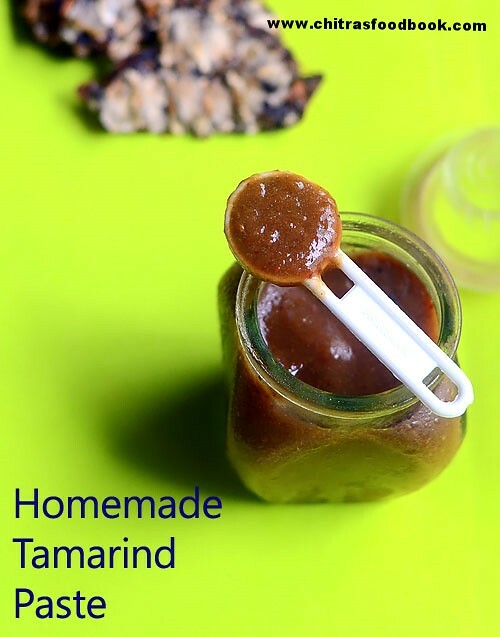 Make your own homemade tamarind paste and use it for your quick cooking ! In my previous post, I have shared the list of essential kitchen appliances needed for a home. 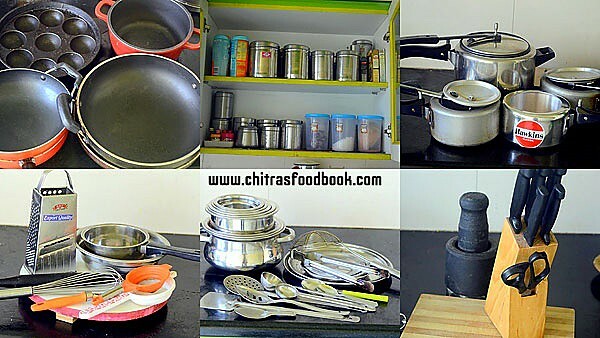 In this post, you can find the list of Kitchen utensils required for setting up a new Indian kitchen.In this post, I have discussed the uses of utensils & kitchen tools and shared the list of all possible kitchen utensils & tools. I have segmented them under different categories namely Cookware, Storages,Serve ware, Bakeware and tools. But I have not recommended any brands. As I promised in my previous post, I have also shared a PDF of Kitchen appliances & utensils list.Please click on the link and download it, Its free. Do the changes as per your need. All the utensils I have given here are not purchased in one day. You don’t need everything at the beginning of cooking too. It could be accumulated in months, years based on your requirement & usage. I referred this & this post for making the list. I hope this list would help beginners to arrange their new kitchen. Wishing you all the very best. Happy cooking !! Click HERE to view & download the PDF. I have given affiliate links for all the utensils from Amazon with links and pictures. Here is my routine dialogue : Friends, take this list as a guidance and buy the utensils which is of use to you. Even I don’t have many of the tools & utensils listed here . Its just the collection of all possible kitchen utensils & tools.If you feel anything important is missed here, please share it in comments section. I will update it. Thanks for visiting this page.Leave your feedback about this list. It would make me even more happy. 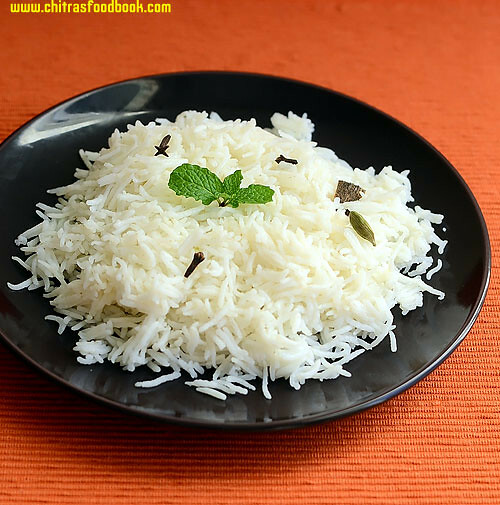 In this post, I have shared how to cook basmati rice in a pressure cooker, open pot, rice cooker and Microwave oven. Basmati rice & Seeraga Samba Rice/Samba rice is one of the most important ingredient for making biryani and pulao recipes.This fragrant rice gives a nice flavor,aroma to the dish and makes it more special.Perfect cooking of basmati rice yields a fluffy,slender,long grain look that makes the dish more appealing to our eyes.So most of us always look for basmati rice cooking tips,correct water ratio,soaking time & proportions to cook it perfectly.Having tried more than 30+ Veg biryani recipes using basmati rice,I thought of sharing my observations and tips to cook a perfect basmati rice in various ways in this post.Cooking jeera rice/Seeraga samba rice is very simple.I have shared the details below.Basmati rice can be cooked in a pressure cooker,rice cooker or in a pot(Open or closed).Its cooking method completely depends on the dish we make.For making one pot biryani or pulao recipes,pressure cooker method or closed pot method is the best whereas for Dum biryani,open pot cooking is preferrable.I personally like to cook basmati rice using open pot method as we can have control over the cooking of rice and remove them without breaking.So in this post,i have shared how to cook basmati rice using pressure cooker,rice cooker,microwave and open pot method.There are many brands of Basmati rice available in the market.But i prefer & buy Kohinoor & India Gate basmati rice.Ok,enough of stories,lets see how to cook basmati rice perfectly with stepwise pictures and its health benefits at the end of this post. For the past few months, I have been sharing varieties of (Vegetarian)Veg biryani recipes in my blog under “Sunday Lunch Recipes”. I hope many of you had found it useful and tried them too. I am planning to compile list of all the biryani recipes under one page for easy and quick reference. But before that I want to make a post on list of spices used in most of the biryani along with pictures and names in different languages like English, Hindi, Telugu, Malayalam, Kannada and Tamil for people to identify & buy them easily in your place. 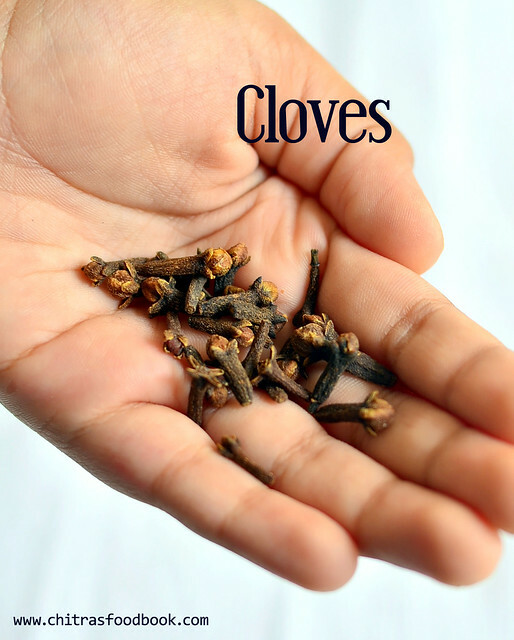 I have also shared their health benefits so that you can enjoy your biryani without any guilt.You can find about cinnamon, cloves, cardamom, bayleaf, black stone flower, mace, nutmeg, kapok buds and fennel seeds. Nowadays in most of the shops all these ingredients are together sold in small packets as “Biryani masala”. You can use these spices to make Biryani masala powder at home. Ok, lets see the biryani spices list with its names and pictures. **All these informations are collected from Internet. Please leave your feedback in comments if you feel anything important is missed or mispelt. I will add them. Thanks ! Fennel symbolizes longevity, courage, and strength. 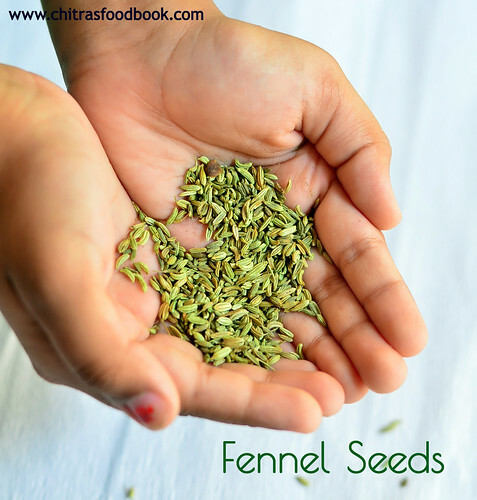 In addition to its use as medicinal values, fennel has many health benefiting nutrients, essential compounds, anti-oxidants, dietary fiber, minerals, and vitamins. It offers protection from cancers, infection, aging and degenerative neurological diseases.. Furthermore, fennel seeds indeed are the storehouse for many vital vitamins. Vitamin A, vitamin E, vitamin C as well as many B-complex vitamins like thiamin, pyridoxine, riboflavin and niacin particularly are concentrated in these seeds. Cardamom is one of the most effective remedies against halitosis. Simply chewing on the seeds eliminates bad odors. Cardamom is even used in some chewing gums because of its effectiveness, billed as a surefire cure to the most offensive breath.It can also be used to help soothe a sore throat and relieve hoarseness of voice. The volatile oil in cardamom has been proven to soothe the stomach and intestines, making cardamom an ideal solution for a host of digestive problems, such as constipation, dysentery, and indigestion. Cardamom can be used aromatically to increase or encourage appetite, and also assists in soothing gas and heartburn. Generally, cardamom relieves most upset stomachs. To use Cardamom for digestive problems, consume seeds alone, serve ground seed with food, or serve as a tea. South Asians use cardamom’s relieving properties to help with the discomfort of passing gall and kidney stones. Cardamom, combined with banana leaf and alma juice, can act as a diuretic, soothing a variety of kidney, bladder, and urinary problems like nephritis, burning or painful urination, and frequent urges to urinate. The relief from uncomfortable symptoms provided through cardamom should not be considered a cure to underlying diseases and disorders. Cardamom oils can be added to baths as a form of aromatherapy that fights depression and reduces stress. 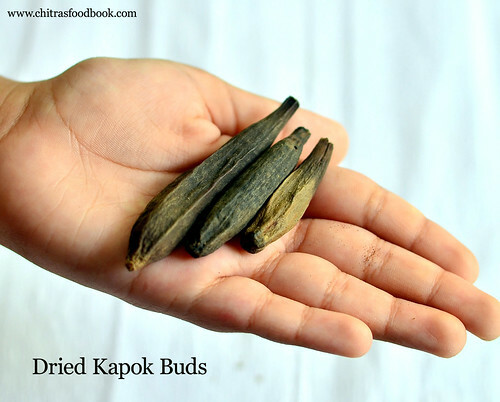 Ground Cardamom seeds can be made into a tea for similar benefits. 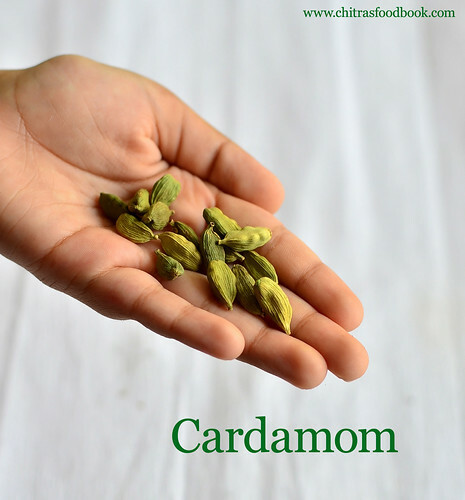 Cardamom helps to fight cancers like breast cancer, ovarian cancer and prostate cancer. Early research suggests that consuming cardamom regularly may help with preventing these forms of cancer. In addition to these specific medicinal uses, cardamom contains an abundance of antioxidants, which protect the body against aging and stress and fight common sicknesses. 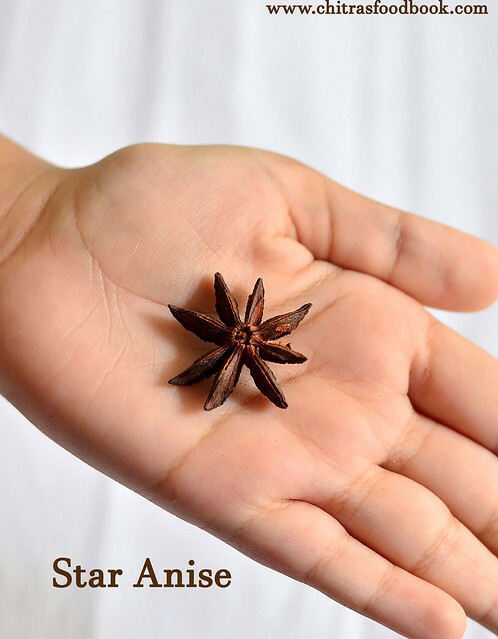 Medicinal Value :Star Anise fruit is anti-bacterial, anti-spasmodic and a diurectic. Hence widely used in flatulence or gas like conditions. Culinery and Other Values:Star Anise is a major ingredient in Chinese Dishes for flavoring meat, veggies, curries, confectionaries and for pickling purposes. The oil of Star Anise is used to flavor bakery products, soft drinks and liquors. Also used in perfumery. Good source of minerals like copper, calcium, potassium, manganese, iron, zinc etc. also rich in vitamin C, A, riboflavin, folic acid etc. Used as drug in Eastern countries due to its stimulant, carminative, astringent and aphrodisiac properties. Mace is used in savoury dishes. Cinnamon is loaded with powerful antioxidants, such as polyphenols (3, 4, 5). 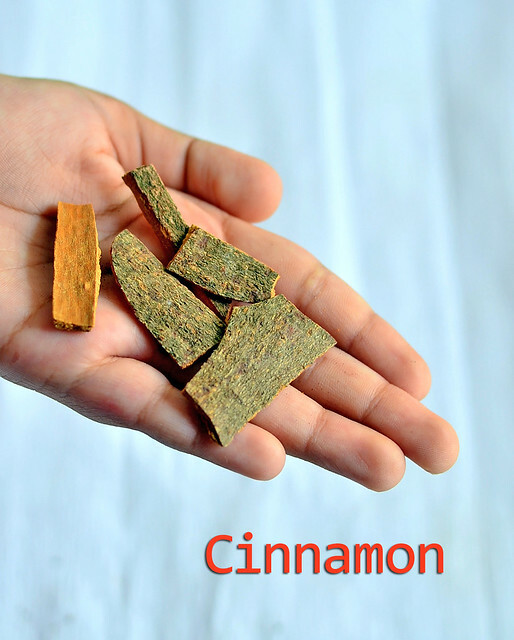 Cinnamon Has Anti-Inflammatory Properties.It helps the body fight infections and repair tissue damage. Cinnamon May Cut the Risk of Heart Disease.In people with type 2 diabetes, 1 gram of cinnamon per day has beneficial effects on blood markers.It reduces levels of total cholesterol, LDL cholesterol and triglycerides, while HDL cholesterol remains stable. Cinnamon May Be Protective Against Cancer.Cinnamon Helps Fight Bacterial and Fungal Infections. 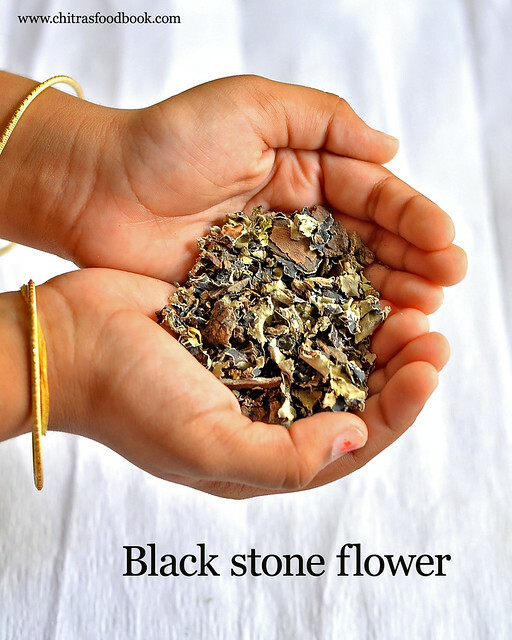 Dagad phool/black stone flower are commonly found in any markets or with spice smiths and it has uses in many dishes in hyderabadi.Similar to those of sweet pepper, it has quite mild aromatic flavor. It is not only used for aromas in soup preparations but also used as soup thickeners. Stone flowers have medical properties to cure HIV virus. Stone flowers are the biological indicators of air pollution. It is a good pain reliever and also promotes early healing of wounds due to its bitter taste. It helps treating the skin related problem due to its cold potency. It helps in reducing any kind of inflammation in body. Induces secretion of gastric & intestinal juices to ease digestion. 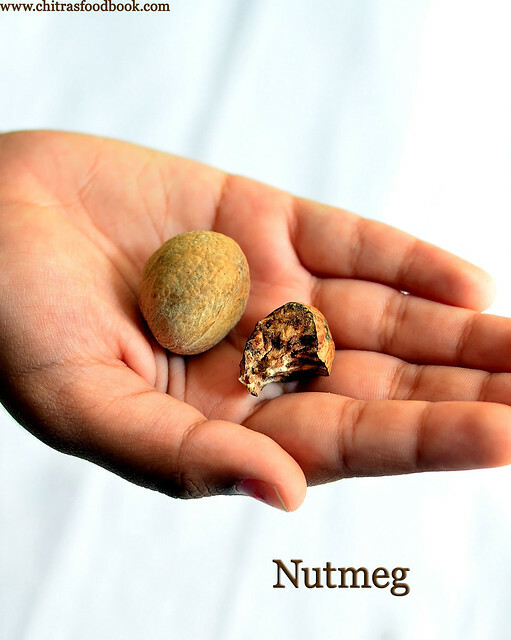 When used appropriately, as a spice, the benefits of nutmeg are obvious, but keep the amount under control, and find your thrills somewhere else! Bay leaves have been found to be effective in treating type 2 diabetes as they cause reduction in blood glucose, cholesterol and triglyceride levels. 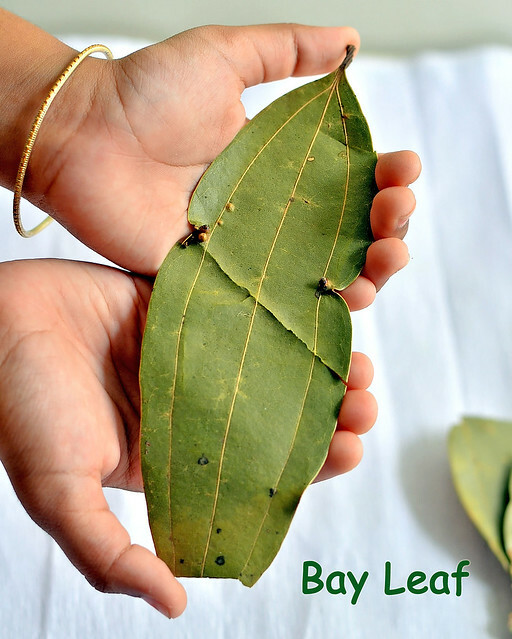 Bay leaves are good for promoting digestion and can treat digestive disorders such as heartburn and flatulence. The powerful phytonutrients in bay leaf provide protection against cardiovascular diseases such as heart attacks and strokes. Bay leaves are effective in fighting the symptoms of cold, flu and infections. 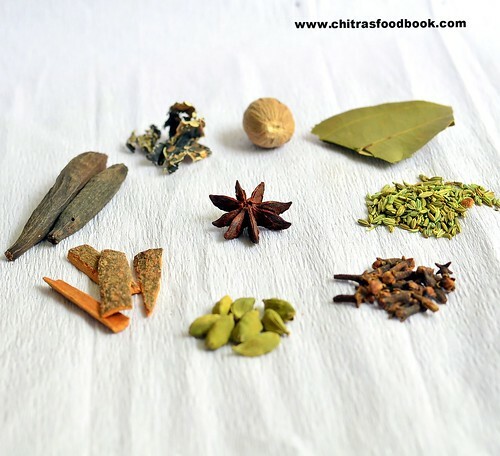 For making any biryani, all these spices plays a vital role. No worries if you skip one or two from the above list. But spices like cinnamon, cloves, bayleaf, black stone flower and cardamom should be used to get the actual flavor and taste of biryani. You can either add them as whole or powder them and add to biryani. Among these spices, I would say black stone flower is the hero. Adding just one or two flower takes the biryani to next level and gives restaurant flavor. So make sure you buy them and keep in your pantry. But remember, do not add more than one or two else its smell would over power the masala. Recently one of my friends in abroad told me to make a post on “How to clean & chop vazhaipoo ie Banana flower/Plantain flower.Also I have planned to share vazhaipoo poriyal recipe in the upcoming week.So before posting that recipe,i thought this post would be useful to you all.Cleaning & chopping vazhaipoo is not that difficult as one thinks.Its just a time consuming job,that’s it.Otherwise its very easy to cook & u can make very tasty recipes with it.As u all know its a super healthy vegetable with amazing health benefits.It contains various vitamins like Vitamin A, C, and E. They also contain potassium and fibers. This makes them an excellent health food and a source of healthy nutrients.It helps to reduce menstrual bleeding & pain.Cooked banana flowers along with curd or yogurt increases the progesterone hormone in the body and reduces bleeding.Calculated intake of banana flowers reduces blood sugar levels. It also increases the total haemoglobin levels in the body.So friends,don’t avoid buying vazhaipoo just by thinking about its cleaning process.Listen to your favourite songs or watch some megaaaa serials,this cleaning job will be done within no time .I follow this usually.If not, at least ask your maid to do this job for you.Try to include vazhaipoo & vazhaithandu in your cooking at least once or twice in a month.Its very very healthy and it makes miracles!Soon i will make a detailed post on how to clean & chop vazhaithandu/Banana stem with its health benefits.In this post,i have also shared some simple tips and tricks for easy chopping and to maintain its color after chopping.Hope it would be useful to all beginners.Thanks for visiting this page.Have a great Sunday ! How to clean & chop vazhaipoo/Banana flower. Spread 2-3 newspapers one over the other Or spread a thick sheet on the floor to prevent stains.Grease your hands with gingely oil very well.Cleaning vazhaipoo makes your fingers black.So this will help to avoid blackening of hands and fingers OR wear some thick gloves. Take 1/4 cup of curd and mix with 2 cups of water.Mix it well & make buttermilk with it.Keep it ready. Now take the banana flower and when u remove the cover,u will see bunches of flowers.Take out the bunch and place it in the newspaper.Remove all the florets and collect in the newspaper. 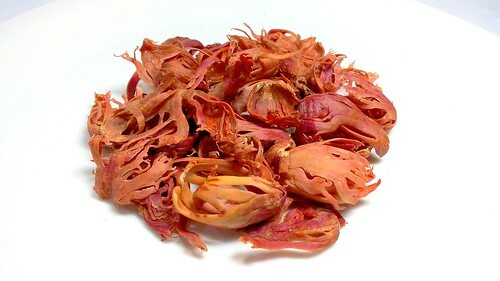 Initially u will find big sized florets.But when u keep on removing,u will find very small florets.So keep the big ones and very small ones separately.Don’t forget to eat the cone shaped,blossom part which is very tender and small in size.Eat it as such.It is very good for stomach ulcers. Take a big floret and remove the stamen(kaalan) and thin white colored cover portions( some people don’t remove this part.My MIL don't remove but my mom does it).Refer picture below. Repeat the same for all the big florets.No need to remove the stamen part for very small ones.You can chop & use as it is. Chop the big florets finely using a knife and keep them immersed in buttermilk till use. This helps to prevent blackening of banana flower.Do this with all big florets.Similarly chop the small florets and put it inside the buttermilk. ( In the below picture,i have added turmeric powder, moong dal and salt to the chopped vazhaipoo and kept it ready for making poriyal.so the color looks yellow.I will try to update a clear picture soon. I usually take a bunch of florets in hand and remove the stamen and cover part & chop it with a knife keeping as a bunch and dip in buttermilk. You can do this cleaning process without chopping in the previous day night and keep it refrigerated in a zip lock bag.If u chopped it,immerse in buttermilk and refrigerate.The next day morning,u can make delicious recipes with it.Suppose if u feel difficult or lazy to chop,here is an easy method of chopping.ie. Take a handful the cleaned banana florets in a big sized mixie jar,run the mixie once or twice for a second.Florets will be coarsely ground.Now take the florets and dip in buttermilk.Repeat the same with all the florets.Refrigerate it overnight and use it the next day. Festivals are around & its time to experiment sweets and savouries at home.This year for Diwali & Navratri,i have planned to share some easy n yummy sweets recipes using condensed milk.Before that i wanted to make a post on “How to make sweetened condensed milk at home with & without milk powder using 3 ways”.So here it is ! Condensed milk aka sweetened condensed milk has become one of the most important ingredients for making sweets/Mithai,cakes and desserts.Actually, before blogging, i was not aware of the term condensed milk and i used to ask for milkmaid or amul mithai in shops.But then after blogging, i came to know they are just the popular brands and its not the name of ingredient .Even now my mom & MIL are very familiar with the name Milkmaid than Condensed milk.We love its taste very much.Generally we all love to use condensed milk in our sweets especially in kheer/Payasam as it adds a rich taste to the particular dish & it eases the cooking procedure too.But some people hesitate to use condensed milk either because of high calorie or by seeing the cost.One can( ie 14oz) of store bought condensed milk is way too costly.I too avoided using condensed milk in my recipes just because of the above reasons.But when i saw Sharmi’s easy homemade condensed milk within 5 minutes using milk powder, i was amazed and bookmarked immediately to try.I have tried it several times and it comes out very well.Once my Sister Radha suggested me another method of making homemade condensed milk using fresh milk & sugar by watching Nisha madhulika’s youtube video.So i tried in that way too.It came out awesome.I myself got tempted and searched for even more simple recipes that can be made with the ingredients easily available in all our pantries and at the same time within lesser time.I found & tried the one from my handwritten cookbook.It came out equally well.So in this post,i have shared all the three methods with stepwise pictures.Each method has its own advantages & disadvantages but the result would be almost the same except color.Do follow any of these methods based on the ingredients and time.U will just love the result and u would never go back to buy readymade,store bought stuffs.It saves your time as well as money .I have used this condensed milk in payasam/Kheer and halwa but not in cakes or sweets.I am yet to try them.Ok,lets see how to make homemade sweetened condensed milk easily using 3 methods. How to make homemade sweetened condensed milk at home with easily available ingredients ! In a vessel,boil water till it starts to bubble.In a mixie jar,take all the ingredients given above.Add this boiled hot water to the jar and blend everything until smooth.Wipe the sides and bottom to remove all the milk powder sticking to the walls.Again pulse for a second and remove.Transfer to a bottle and let it cool.Store in refrigerator up to 5 days.Use as needed ! ( For this method,u need icing sugar.I guess u can use powdered sugar too but i have not tried it.) If it turns thick,add little hot water n mix well.It will thin down. For this method,take sugar and mentioned water in a pan.Boil the water & melt the sugar completely.When it starts to bubble,switch off the stove.Take this sugar solution in a mixie jar and add the milk powder & butter to it.Blend it well to make a smooth paste.Wipe the sides & bottom.Add vanilla essence ( if using) and pulse it again.Remove and store after it cools down.This mixture will slightly thicken after it cools down.So add little hot water to adjust the consistency if necessary. Take the fresh milk in a pan.When it comes to boil and rises to the top,simmer the flame and add the sugar.Stir well and allow it to boil till the milk reduces to 1/3 rd of its original quantity. Keep the flame medium and stir every now n then to avoid charring.Once the milk becomes slightly thick,take a drop of milk and check it between your thumb and index finger.If the milk is sticky,thick and if it forms a half thread,it is done.Switch off ,add butter( if using) mix well and remove.Do not leave the milk to boil & reduce completely because it will become too thick like a cream once when it cools down.So switch off as soon as it reduces to 1/3 rd even if it is slightly watery.Lastly add a pinch of baking soda,mix well & set aside to cool.Refrigerate and use as desired ! Condensed milk stays good for a minimum of 5 days in all the above method.But u should refrigerate it without using your hands.Use a clean spoon to handle. This condensed milk with thicken once it cools down.So add little hot water and adjust the consistency. 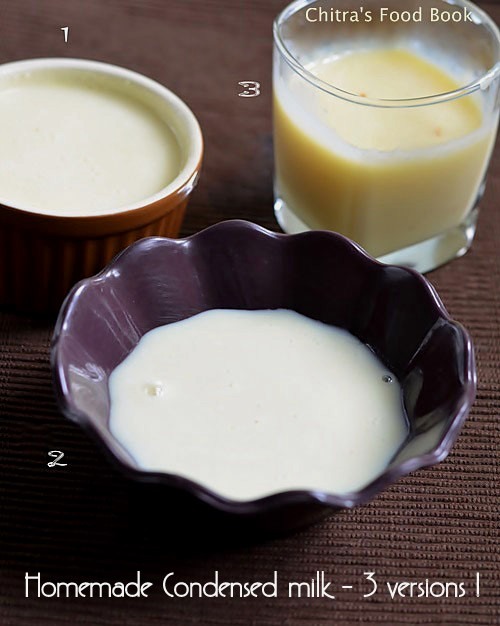 The color & consistency of condensed milk may vary in each method but tastes equally good. Condensed milk tend to thicken when it cools down.In that case,add some hot water,mix well and store it. The sweetness would be more in method – 3 than method – 1 & 2.So please adjust as per ur taste buds. Make your own condensed milk in your kitchen using any of the above 3 methods.Save your money, time n Enjoy making your favourite sweets !